In 2010, DARPA announced it was creating an autonomous, submarine-hunting war machine that would be manned with exactly zero people. Now, that vehicle is ready for action. 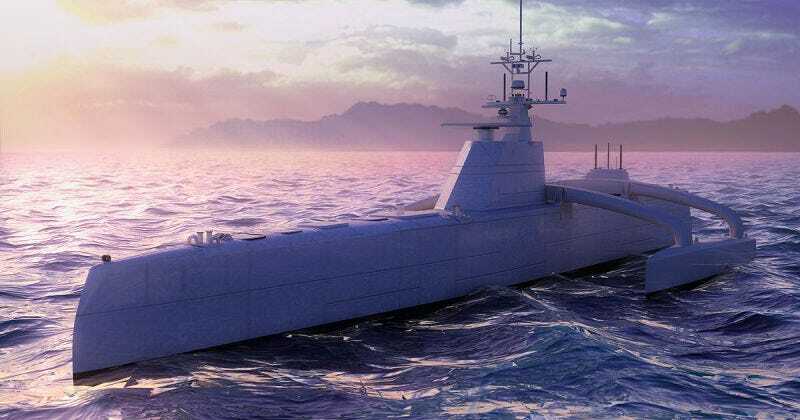 The Anti-Submarine Warfare Continuous Trail Unmanned Vessel, or ACTUV, is now scheduled to be launched April 17 from the Vigor Shipyards in Oregon. The ACTUV will continue sea-trials for 18 months following its maiden voyage, where it will be tested for its long-range tracking and self-driving functions. The primary objective of the ACTUV will be to track enemy submarines in shallow waters. The ship is designed to operate autonomously for 60 to 90 days straight, eliminating the hundreds of crew members it typically takes to operate these type of vehicles. The ACTUV also reduces the chance for human error while searching for potential threats. The ACTUV itself is unarmed, but as a scouting vehicle, the ship can be used to locate spying adversaries before other ships are deployed. The ACTUV is pretty cheap to operate, too. The cost of running one per day is between $15,000 and $20,000, according to a Sea Magazine report. The ship is part of the Pentagon’s ongoing Third Offset strategy, which was devised to help the U.S. maintain superiority over rising military powers like China and Russia. The Pentagon is dedicating $18 billion to the effort.